Using a sharp knife, cut into the chicken breasts twice on each side. Put into a polythene bag with the soy sauce and sherry, seal the top, shake well and set aside for at least 5 minutes. Meanwhile, set some water to boil in a saucepan and place a steamer basket on top. Halve the pak choi or shred the Chinese leaf. Place into a shallow heatproof bowl that is small ennough to fit into the steamer. Season lightly. Place the chicken breasts on top and pour over the marinade. Sprinkle over the five spice powder and sesame oil. Top with long, thin strips of spring onion. Put the plate into the steamer and cover. Steam for 10 minutes, till the chicken is cooked through. 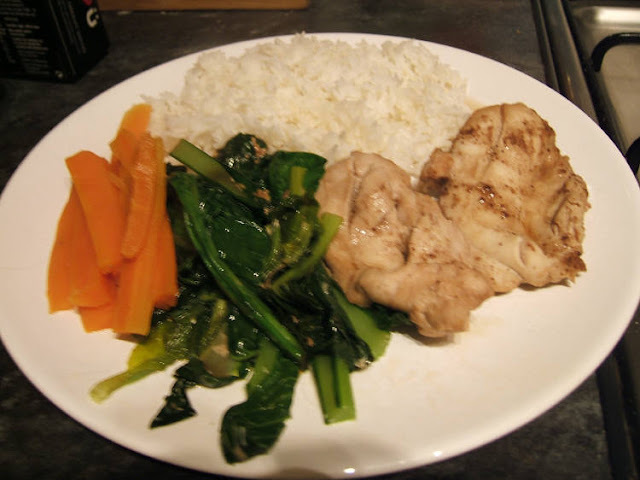 Serve with rice and steamed or lightly boiled vegetables. We didn't have any light soy sauce, so I used dark. It didn't seem to matter too much. We didn't have any dry sherry, so I used cream sherry. It didn't seem to matter too much. We didn't have any pak choi or Chinese leaf, so I used Choi Sum. I found it very bitter but The Doctor liked it. I didn't feel the need to add extra salt, as the soy sauce is quite salty in itself. It didn't seem to matter too much. I don't like spring onion, so I missed it out. It didn't seem to matter too much. We didn't have a bowl that would fit into the steamer, so I lined it with the Choi Sum and was very careful how I poured on the marinade. We lost some of the juices in dishing up but it didn't seem to matter too much. Pre-heat the oven to 190oC/Gas Mark 5 and spritz an ovenproof dish with oil. Cook the pasta shapes in boiling water for 10 minutes. Meanwhile, cut or break the broccoli into florets and add these to the pasta for the last 3-4 minutes of cooking time. Drain the pasta and broccoli and return to the saucepan. Drain and flake the tuna and mix with the pasta and broccoli then tip into the ovenproof dish. Beat together the eggs and milk and season with black pepper (if using tuna in brine you won't need any additional salt). You could also add some fresh or dried herbs. Pour over the pasta mixture. Grate the cheese and sprinkle over the top then bake for 35-40 minutes, till set and golden on top. Good served with a side salad of your choice! Oh yum, oh yum!! It is a bit pricey (though you do make the monkfish go a long way), but see the notes at the end for ideas on how to do a lower-cost version. Preheat the oven to 220oC/200oC fan/Gas Mark 7. Cut the monkfish into about 12 pieces of roughly equal size. Remove the ciabatta crust and tear the bread into the same number of pieces - they should be roughly the same size as the fish. Keep the top inch or so of each rosemary stalk intact, and remove the leaves from the rest by running finger and thumb down the length of the stalk. Put the rosemary leaves and garlic into a pestle and mortar and bash them together then add 2 tablespoons of olive oil. Put the fish and bread into a bowl, add the rosemary oil and toss together. Cut the bottom of the first rosemary stalk at an angle to create a sharp point. Thread on a piece of monkfish followed by a piece of ciabatta and repeat. Each stalk should hold two pieces each of fish and bread. Do the same with the other stalks until all the monkfish and ciabatta has been used up. 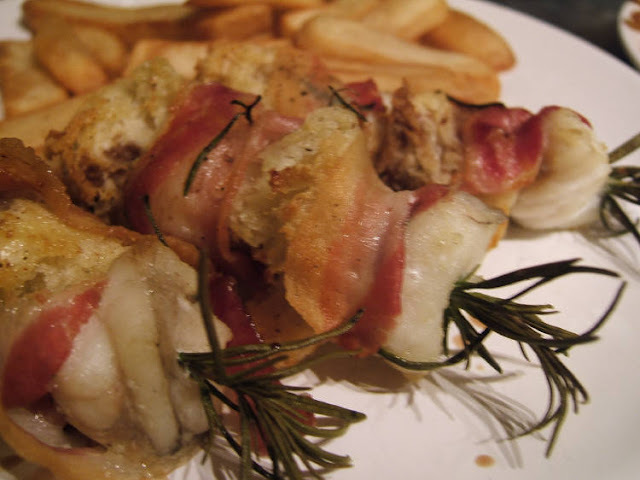 Wrap a piece of pancetta loosely around each skewer, tucking it between the pieces of monkfish and ciabatta. Place on a roasting tray then season with black pepper and sprinkle over any remaining oil from the bowl. Bake for about 20 minutes, till the bread is crisp and golden and the fish cooked through. Drizzle with a little balsamic vinegar, a little extra olive oil and any juices from the tray to serve. Lovely as they are for a starter, or with a salad for a light meal, or with chips or potato wedges as a main course. For a cheaper version, use any meaty white fish instead of the monkfish, and smoked streaky bacon instead of the pancetta. Preheat the oven to 130oC (fan)/150oC/Gas Mark 2 and grease and line a 7" square tin. Warm together the butter, treacle, syrup and sugar till melted, then add the milk and allow to cool. Beat the eggs and blend with the cooled mixture. Sift the dry ingredients into a large bowl then gently fold in the cooled treacle mixture. Pour into the prepared tin and bake for 1 1/4 - 1 1/2 hours, till a skewer inserted into the centre comes out clean. Keeps for a few days in an airtight container. You can also freeze individual slices and thaw them as required. Trim the ends of the celery and cut into large chunks, peel and chop the onion, and peel the carrots before halving lengthways and then cutting into large pieces. Put the olive oil, vegetables and bay leaves into a large pan and cook over a medium heat for 10 minutes. Add the beef and flour and stir well then pour in the Guinness and tomatoes. Season and stir well. Bring to the boil, cover and simmer gently for 3 hours, removing the lid for the final 30 minutes. Great with boiled or mashed potatoes and vegetables, or with rice. Alternatively, once cooked, put into an ovenproof dish and add a puff pastry lid, or a topping of sliced or mashed potato, and cook for 40 minutes (pastry or sliced potato) or 25 minutes (mashed potato) at 180oC.